Music Is The Answer Labor Day Weekend At Wet Republic!! | Do You Hear The Music? Music Is The Answer Labor Day Weekend At Wet Republic!! One week away from today begins Labor Day Weekend music mayhem in Las Vegas and I can tell you I’ll be visiting one of my favorite spots, Wet Republic! Between MDW and LDW I’ve spent my fare share of holiday weekends (and birthdays) at this pool and always have the best time. From Swedish House Mafia and Deadmau5 to Afrojack and David Guetta, you name the DJ and chances are good they’ve performed at Wet Republic. 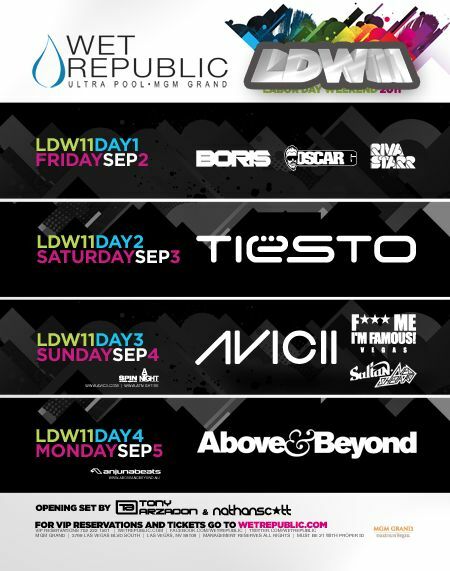 This LDW brings a solid four day line-up (see below) but I’m actually most excited for daytime partying on Sunday because of Avicii and Sultan & Ned Shepard spinning the weekly F*** Me I’m Famous party. Plus I still can’t get Avicii’s “Fade Into Darkness” out of my head.